Prices for a wheelchair stair lift range from $1,000 to $4,200, with higher costs for curved stair cases, with prices starting at $5,950. The price of a wheelchair stair lift depends on many factors – is it a straight or curved stair way? Is the stair lift battery operated or A/C powered? Is it a plain, basic chair lift with standard features or does it have high end upgrades, including custom upholstery and automatic folding options? The difference between straight and curved staircases represents the biggest factor in price. Stair lifts are easily installed on straight staircases, with the rail cut to match the length of the staircase. Curved stair lifts require a custom-built rail to match the contour of the staircase, so they can maneuver through 90- and 180-degree turns. If a new wheelchair stair lift doesn’t fit into your budget, you can buy a used lift that can cost half the original price. If you are going to buy a used lift, make sure you give it a thorough check up, and if you buy it from a private party, ask a medical equipment vendor to check it out. Ask the vendor if they will repair it and check with a professional who can measure the equipment to be sure it fits you. You can also rent a stair lift, which is an affordable option, especially for someone with a short term disability who may need the stair lift for a limited time. Look online for stair lift companies that provide a variety of lifts for all stairway configurations, even stair lifts for outdoor stairways. Finding a reputable dealer will allow you to browse around some of the different models and give you an idea about the variety of wheelchair stair lift prices that are available. If you find having a new stair lift installed is a bit too pricey, look into used or refurbished stair lifts that are affordable or rent a stair lift. There are also financing options available. Also remember that stair lift prices increase with custom models for curved stairs. 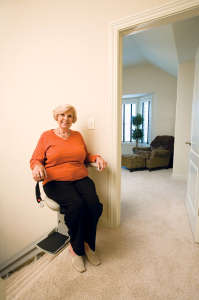 Your stair lift representative can work with you to find the best lift at the lowest price. Check with the manufacturer for special prices for veterans and buyback programs for stair lifts that no longer suit your needs. Suffering from limited mobility can take quite a toll on your spirit, and finding out that stair lift prices are too high can be more devastating. Look online for wheelchair stair lift vendors that offer reasonable prices and expert installation and service, and your mobility problems will be solved.